I am looking for information on my dad's unit. I can find very little information about what they did during the Korean War. I know the stories that daddy told me, and I am finding that some of them are very similar to some I have read that took place at the Chosin Reservoir. My dad died in January 1978 so I cannot ask him any questions nor do I know anyone who knows his story. What I do know is that what he experienced in the Korean War had a very profound effect on his life. 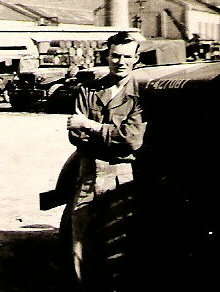 My daddy was PFC Ernest William Booth ("Gus" was his nickname his whole life; I do not know if his Army buddies called him that or not) from Vidalia, Georgia. He was about 19 years old in the Korean War with red hair, blue eyes, freckles, and a square chin. Daddy arrived there on November 11, 1950 and was immediately plunged into the war according to his account of the war. Daddy was injured on January 31, 1951 (serious head injury) but returned to duty in mid-February. I have attached a couple of pictures of him and can send more if needed/wanted. The second picture is with a group of the 3rd Rangers. Daddy was not a Ranger, but was attached to them somehow. He is the soldier who is checking the backpack of another soldier. I know for a fact that this picture is my daddy, and I have confirmed with Bob Channon (a 3rd Ranger in Korea) that he was not a Ranger. I remember daddy talking about being "point man" and that the Rangers used him for that. I also remember the story about eating dog in the home of some North Koreans when he was in the Chosin area. Daddy was with the 3rd Infantry Division 15th Infantry Regiment 2nd Battalion Company G according to his records at Ft. Benning, Ga. Most of daddy's records were destroyed in the fire in St. Louis. He was 100% service connected disabled veteran. I would love to communicate with anyone who may have known daddy: PFC Ernest W. Booth. I would also love to have information telling me what his unit did in Korea. I have bought many books and looked up the info in the indexes and tried to piece it all together, but it is very confusing. I think he may have been part of X Corps, too.